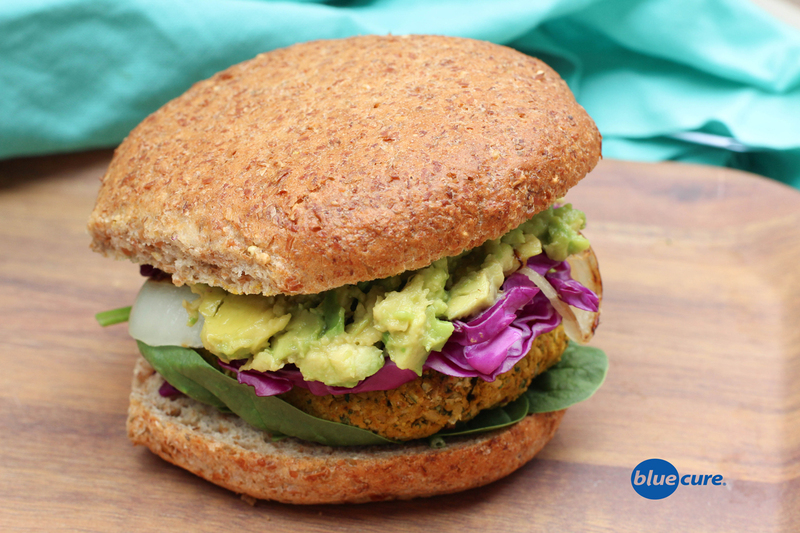 Homemade veggie burgers are cheap and easy to make! The hardest part about making veggie burgers is waiting for them to finish cooking! They make a great Meatless Monday option or a plant-based meal any day of the week. Chickpeas— and other beans— are great sources of protein that can be used in versatile ways from spreads to sauces to base of burger patties. They can even be used in smoothies! These cauliflower chickpea burgers are a bit spicy— so omit the crushed red pepper if you don’t like it hot. This recipe will make a small batch of burgers. If love the burgers, you may want to make a larger batch and then store them in the fridge or the freezer for the week to make for quick, go-to-meals on busy nights. Preheat the oven to 400F. Drain and rinse the chickpeas. Set aside. Wash the greens and the cauliflower. In a food processor, pulse the cauliflower until chopped into small pieces. Using a spoon or spatula, transfer the cauliflower to a large bowl. Add the greens the food processor and pulse to chop the greens into small pieces. Transfer to the bowl with the cauliflower. Add the chickpeas to the food processor with the spices, ground flax, and water. Pulse together the ingredients. Then add in the greens and cauliflower, continue lightly pulsing. Avoid blending the mixture. Once the mixture sticks together when pinched, roll into 2 large or 4 small burgers. Place the burgers on a pan lined with parchment paper and bake for 20 minutes and then flip the burgers. Bake for another 20-25 minutes or until finished. The burgers will firm up as they sit. Serve on a bed of greens or on a whole grain bun with avocado, caramelized or raw onions, shredded cabbage, tomatoes, and more greens. Enjoy! Discover more delicious recipes like this one.